PipelineStudio is the industry-leading pipeline management design software and engineering solution that combines graphical configuration and reporting tools with industry-proven simulation engines. 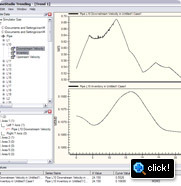 It provides fast, accurate, robust and reliable answers to a wide range of steady-state and transient analysis challenges. PipelineStudio delivers rapid and accurate offline Pipeline management design, planning and hydraulic analysis for natural gas and liquid pipelines through advanced state-of-the-art simulation techniques. The combination of both steady-state and transient hydraulic simulation within a feature rich Windows graphical interface enables better understanding of even the most demanding problems by providing appropriate analysis of the process. PipelineStudio has been proven to be an effective decision support tool that really can deliver financial benefit to your organization. © 2012-2016 EngineeringSoftwares.COM - All rights reserved.